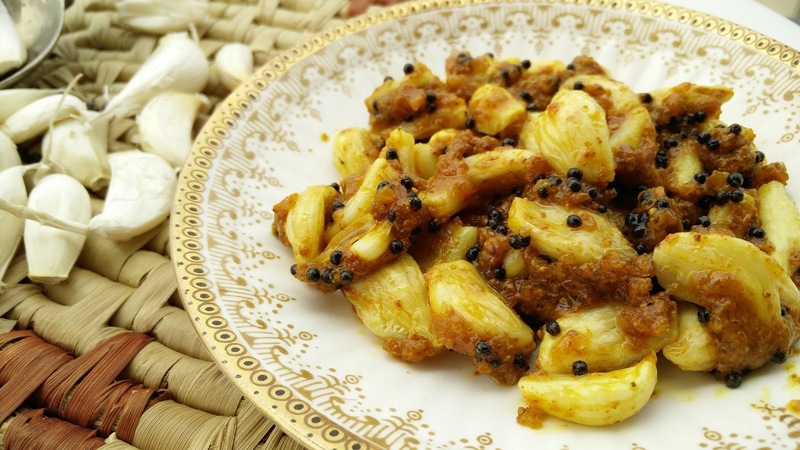 Garlic pickle is really very simple to make, if garlic is kept peeled and ready to use. The taste of garlic pickle will make you lick your fingers. 1. Microwave garlic cloves for 4-5 min and allow it to cool down for 1 hr at room temperature. 2. Dry roast fenugreek seeds and grind to form a powder. 3. Once garlic cloves cools down, add all spices along with fenugreek seeds powder and vinegar. Mix well. 4. For tempering, heat mustard oil in a pan, splutter mustard seeds and add asfoetida powder. Switch off the flame. 5. Top this heated oil on the garlic mixture. Do not mix immediately. Leave it aside for some time, thereafter mix well and store the pickle in a airtight glass jar. Garlic pickle is ready.